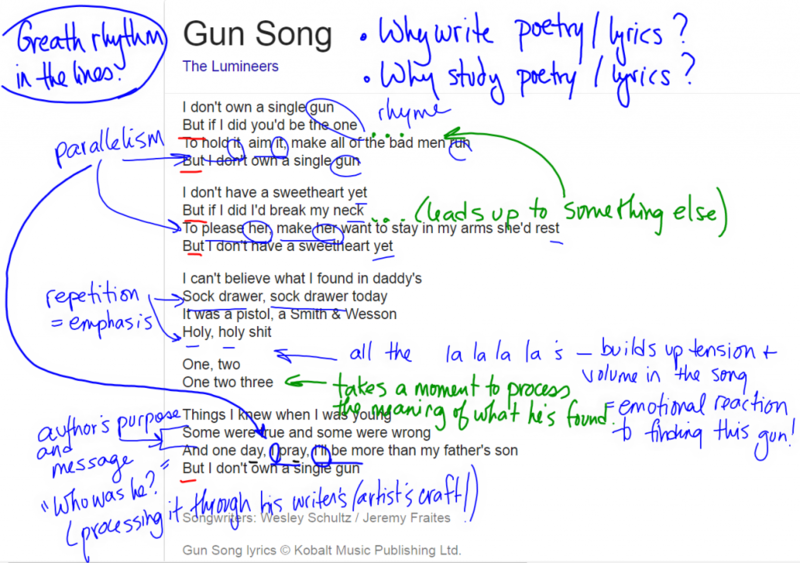 The Lumineers – the lead singer, Wesley, mentioned his father died ten years ago and he thought he was managing that loss, until one day he needed a pair of black dress socks and went to borrow a pair from his father’s sock drawer. In it, he found a pistol – a pistol he never knew his father owned. The following song is about that moment and his processing of that new information. He mentioned the struggle, the reality of his father’s loss then, realizing he had questions he knew could never be answered. A question a young student might ask is “why do people write poetry” and “why do we read poetry”? People write poetry in moments like Wesley’s, in an effort to process something important in their life. Others then will read that poetry to help them understand their own experiences, see how others processed those difficult thoughts and emotions, and develop a wider understanding of what it means to be human and interact with others. We also watched another video, a true exchange between two exes who still held hurt from their relationship. Does this seem like a typical type of exchange between two exes, from your experience of romantic relationships? You’ll have an assignment where you’re asked to select a poem of at least 15 lines written by a Canadian poet of an appropriate difficulty level for Grade 12. You’ll prepare/practice your oral presentation of the poem and record it, combine that audio with image files using a multimedia program, like iMovie, and publish a polished multimedia project as a final product. To help you get in the mindset of what proper speaking of poetry sounds like, there are resources collected here to support you. 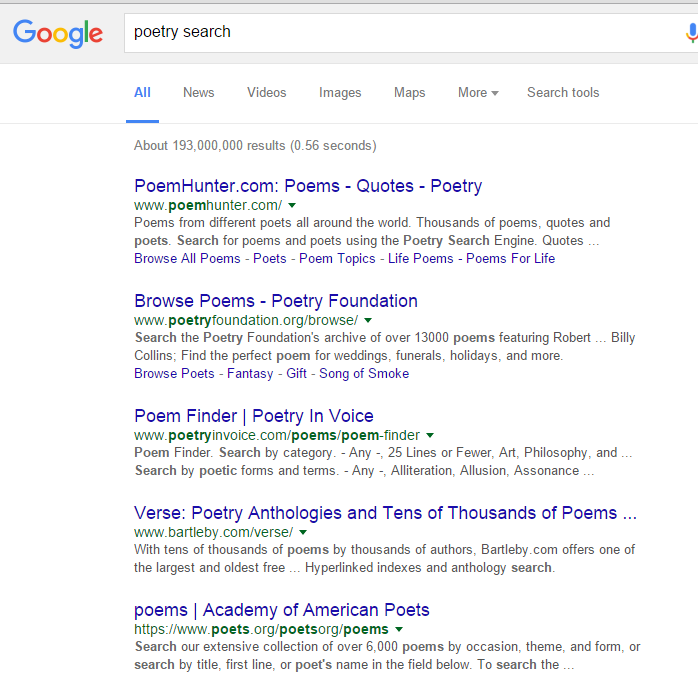 Website of celebrities or poets presenting spoken poetry. In particular, you can listen to the very last poem spoken by actor Anthony Hopkins. Another is a Shakespeare sonnet spoken by the voice of “Darth Vader”, James Earl Jones. Video: This resource reviews five specific things to consider when preparing to speak poetry orally. 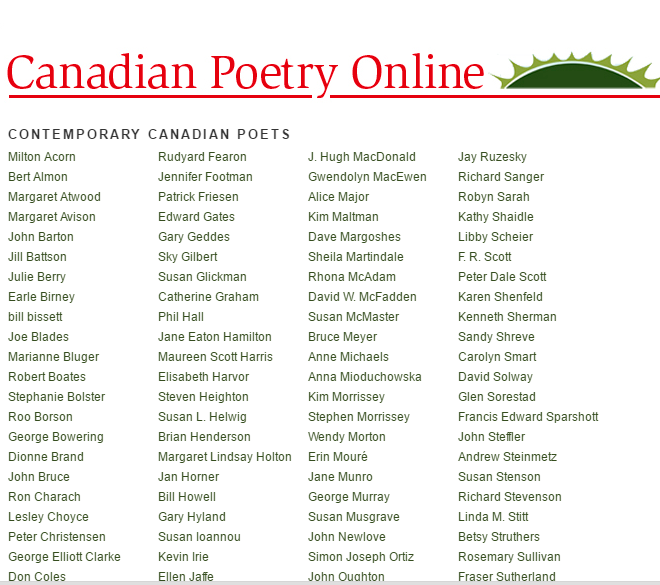 There are hundreds of poems to select from on this resource page. Any other lines in the poem significant in hinting at meaning? summarize what is inferred by the commercial/ how does the commercial interpret the poem? Is it the same as your interpretation? What’s the error everyone makes in understanding this poem? What’s the poem’s true meaning? Do you see it/understand it? Were you correct in your own understanding? Below are student video representations of the poem. If you have time after studying the poem and writing your comment below, you can watch the two videos and leave a second comment to this blog post explaining which you feel is a better representation of the poem. Be sure to support your answer with a specific reason. Do some online digging and find a poem that stands out to you related to our common topic of Decision-making. Identify 5 qualities of the poem that stand out or draw a reaction from you. For each of the 5, write one sentence explaining what you recognize or what stands out as being important to you. Number each sentence and try to make your points specific about this particular poem you’ve selected. Once you have your poem and 5 points made about it, copy and paste that into the comment space to this post. Make sure you leave your name. Note: If your comments are general enough that they can be applied to another random poem about Choices, your point is not specific enough. In this section, we’re going to focus more on shorter texts, poems, rather than articles or short stories. There will be several stations set up and you can work through them in the order you want and on your own or with a par tner. If you’re not able to finish within a certain amount of time, you’ll be able to complete from home as well. The paper copies are posted in the different corners of the room to work through if you like, or the same information is available online if it’s your preference to stay in one spot and chose the order you’ll work through the tasks. Note: After completing each section, make sure to leave a comment on the blog post. Follow the directions for what the purpose of that comment will be for each. Station B: Judgement – is the poem negative or positive? Station C: Comparison of two poems – mostly similar or different?